Environmentalists will on Wednesday launch a legal challenge aiming to stop the legal killing of sharks, including several protected species, in the world-heritage listed Great Barrier Reef marine park. The Queensland government runs a shark control program that uses drum lines – baited hooks to lure and kill sharks – near popular swimming spots along the state’s coast. More than 170 government drum lines, at 27 separate locations along the length of Great Barrier Reef, require authorisation from the Great Barrier Reef Marine Park Authority (GBRMPA). That authorisation is now subject to a legal challenge by the Humane Society International and the NSW Environmental Defender’s Office. GBRMPA granted a renewed approval for the state’s shark control program in 2017. The Humane Society International will argue in the administrative appeals tribunal that the approval of shark control measures is in conflict with the authority’s responsibility to protect the reef, citing evidence the drum lines continue to kill sharks, turtles and rays. The animal welfare group will also present expert evidence that a lethal control program is not needed to protect humans. Increasingly, experts have raised doubts about the effectiveness of culling and the use of drum lines. 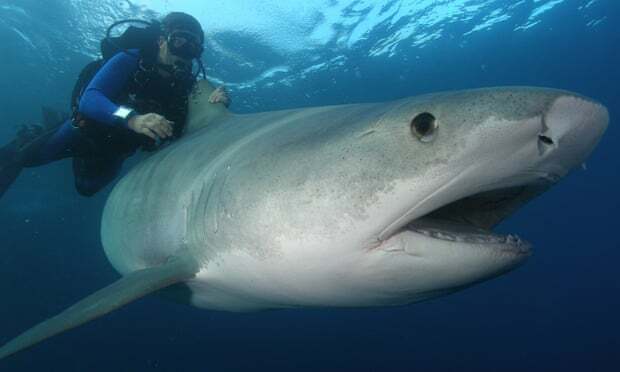 Jessica Meeuwig, the director of the Centre for Marine Futures at the University of Western Australia, said in 2014 that Queensland’s shark control has “taken a large toll on wildlife, while any increase in human safety has been equivocal at best”. Sea Shepherd Australia told the Guardian last year that a survey of drum lines had found they were often left for days without bait, and that they “created a false sense of security” for swimmers. Beynon said sharks were often found alive and in distress on drum lines, which were not checked daily. Many species are shot if found alive. Last year, the government responded to two shark attacks at Cid harbour, a site where sharks are known to feed, in the Whitsundays by bringing in temporary drum lines. A spokeswoman for GBRMPA said that under the Marine Park Act and zoning regulations, “a program to take animals that pose a threat to human life or safety and conducting research is allowed with the authority’s permission”. In its decision to renew the government’s approval for shark culling, the authority considered that “given the nature, frequency and extent of public access to the marine park ... the risk of a shark attack on a person swimming in the marine park is reasonably foreseeable”. The authority also concluded that there were adequate safeguards in place to protect the environment.